Michelle Obama had some harsh words for “special interests” focused on rolling back food policy reforms, like school food standards, while speaking at a Robert Wood Johnson Foundation (RWJF) event in New York City on February 5. The event recognized the fifth anniversary of the First Lady’s Let’s Move! initiative and also announced RWJF’s latest $500 million pledge to reverse the childhood obesity epidemic over the next 10 years. Mrs. Obama also highlighted gains made in the past eight years, including kids’ school lunches filled with fruits and vegetables and whole grains as well as “creative efforts to get kids active during the day.” She also noted how grocery stores are now “cropping up in under-served areas,” and that convenience stores are selling fresh produce. • Eliminate the consumption of sugar-sweetened beverages among 0-5 year olds. Notably absent from the list of priorities was any specific focus on ending food and drink marketing to children, which many public health experts believe is key to ensuring that children maintain a healthy weight and good eating habits. Also, while the narrow focus on eliminating sugar-sweetened beverage consumption from a specific age range (0 to 5 years old) is understandable from a foundation’s perspective, any further gains within that age group will surely disappear as children age beyond kindergarten and sugary drinks become readily available and heavily marketed where children and teens congregate (including the Internet). Another advocacy organization or foundation would be wise to step in and simultaneously fund initiatives designed to reduce marketing and consumption of sugar-sweetened drinks among older children and teens. It remains to be seen if RWJF will focus on sustainable policy change through legislation over the next decade. Some of their past initiatives have favored voluntary measures — for example, the food and beverage industry’s Healthy Weight Commitment Foundation, which announced it had voluntarily cut 6.4 trillion calories from our food supply — mostly from heavily processed foods including a variety of chips, beverages and sweets. (To date, there is no evidence that this has had any impact on childhood or adult obesity rates.) 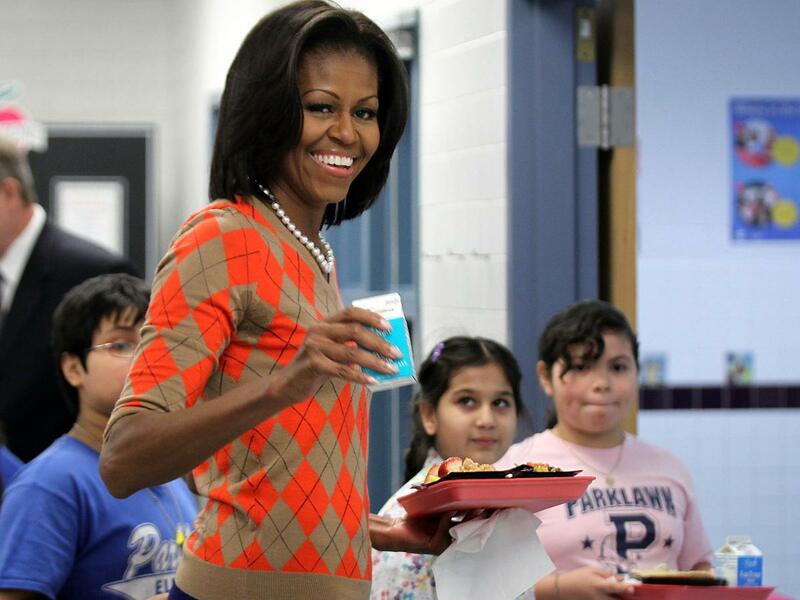 While voluntary initiatives can be helpful, they will be extremely difficult to sustain once the First Lady leaves the White House and the spotlight fades from child nutrition and health. West Side High’s Principal Jean McTavish, received well deserved praise throughout the event for personally championing a culture of health on her school’s campus. Among her many accomplishments, McTavish personally teaches a spin class at the school and reportedly ordered all vending machines turned around so they could not be accessed when vendors refused to stock them with healthy options. If every school in America had a champion like Jean McTavish, we’d be well on our way to a healthier life for our children. Unfortunately, few schools have a well-informed, highly motivated leader like Ms. McTavish, making policy change critically important if we wish to make healthy schools and communities the norm. The First Lady’s most important statement about improving our culture of health and nutrition may well have been that, in spite of gains, “we cannot afford to be complacent for a minute.” With well-funded opponents like Big Food and the School Nutrition Association working furiously to roll back school nutrition standards and prevent further healthy changes to our food system, complacency would take us right back to where we started.